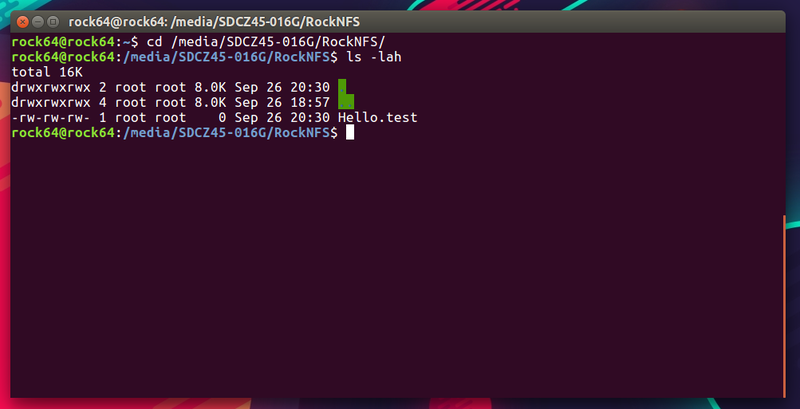 This quick and simple guide will show how to create a NFS Share using your Rock64. 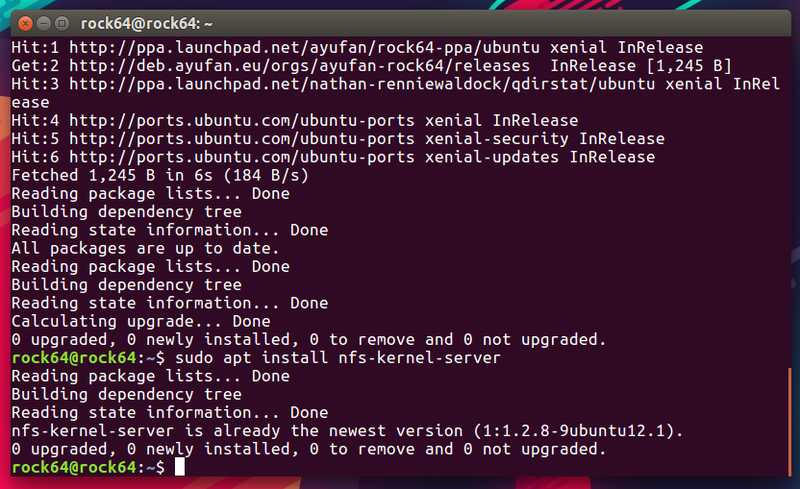 NFS has a few advantages over SMB, if you know your network well and will use it with linux clients. 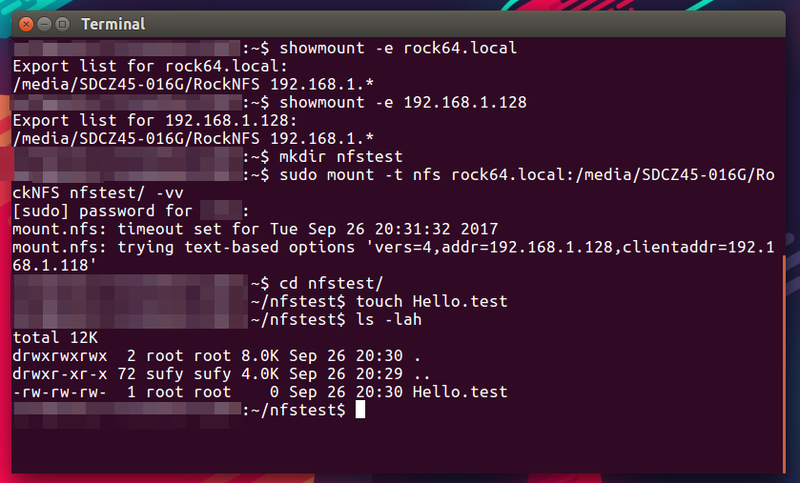 Apart from marginally faster file transfers, NFS allows you to retain Unix File permissions. After the server is installed, now its time to edit the configuration file, to add a share definition. The next field (192.168.1. *) simply defines what part of your local area network is allowed to access the share. I've configured it so that any computer with the IP address from 192.168.1.1 to 192.168.1.254 can access it. You can allow any (local) IP address to access the share using "*. *" or you can limit it to a specific IP address of a computer. The server will now be up and running! The "e" arguments tells the showmount command to show the export list from the server. Next, you'll need to mount the share. I did this in my Home directory, making a new test folder for it. The mount command could be invoked now, and you can mount the NFS share to the new directory that you've made. The "-vv" means its verbose; it prints out status and progress. The command you use will be different based on your host and client. 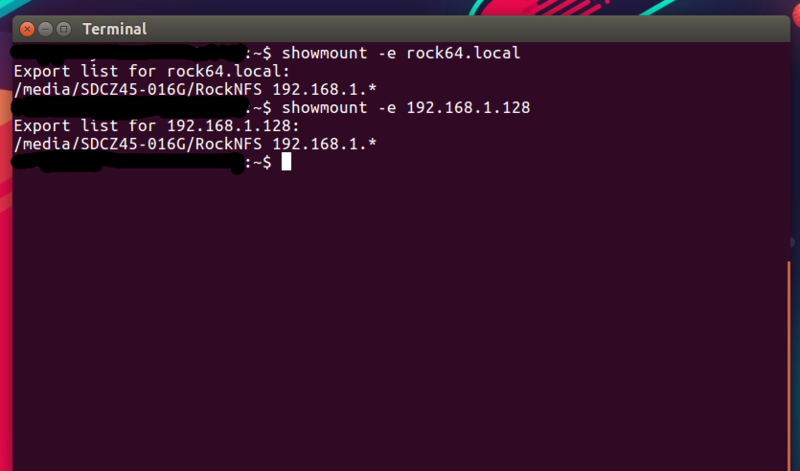 When typing it out, after putting down the hostname (rock64.local:/), I was able to use tab completion to complete the rest of the location without manually typing it out. Simply hit the "tab" key, and it should autocomplete the rest of the path. You can make a test file in the folder, either using the terminal, or a graphical file manager. I made a test file on my client using the "touch" command.